I've seen a lot of disgusting things on the web but Ear Wax candy may just top it all. It's a plastic ear filled with candy ear wax. Though it looks like the real thing, it's actually fruit-flavored gel. Attached to the package is a "Q-Tip" kind of thing, but instead of cotton swaps, it has little lollipops on the ends. 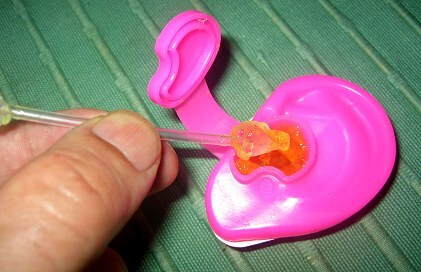 You eat the candy by dipping the edible swab into the ear and scooping out some ear wax. It's almost too gross for words. Although disgusting I will order some for some of the neighborhood kids for Halloween. Mary is quitting smoking online, and now you can watch for whatever reason... you sicko. Would you want a pair of these?